A compact model for applications requiring a superior professional equipment, being at the same time light and easy to handle. Suitable for almost all cleaning duties: deep cleaning, stripping, spray cleaning, polishing and shampooing. Very strong induction motor, for long lifetime and great performances. Double protection against unintentional start. Satellite and planetary gearbox for high power transmission, long lifetime and low noise level. Coupling for both pad holder and brush. Handle of last generation, result of a perfect synthesis among great sturdiness, ergonomics, safety and innovative design. 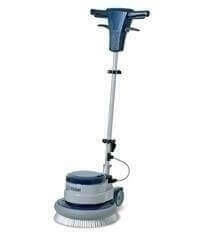 Working width : 330mm / 13"
Compact, Versatile, robust, efficient, Wirbel single disc machines allow different types of cleaning tasks such as washing, deep-cleaning, stripping, polishing and crystallizing on different kinds of materials: textile flooring, brick, stone, stoneware, clinker, marble, it is possible to sanding parquet and level cement floors. They are universal machines, simply and reliable, giving excellent results in a practical, economical and fast way.